When does the Transfagarasan Highway open? Since we're running cycling tours on the Transfagarasan here at Martin Adventures, I'm really interested in finding out when does it open and, of course, close. The Transfagarasan has its own functioning rules that state when this road is operational every year. The Transfagarasan Highway closes every year on October 31st. According to the sames rules, the Transfagarasan Highway opens again on July 1st. Is the whole Transfagarasan Highway closed? No. The Transfagarasan Highway is 90 km long and out of that, only 25 km are closed every Winter until Summer. Check the explanation below. Why is the Transfagarasan Highway closed seven months a year? That's a great question. Of course there are other roads in Europe and in the World that are higher than the Transfagarasan (2.100 meters) that don't need to be closed. The reason is that the Transfagarasan is not safe in winter. Basically, there aren't enough snow and avalanche protection systems and it would be dangerous to attempt driving the road during winter. Does the Transfagarasan ever open earlier? Yes. And there are two sides of this answer. First, the official one. There are cases when the snow melts before the 1st of July so the authorities start preparing the road when they have this opportunity. After this, they make an on-site inspection and decide to officially open the road earlier then July 1st. And second, the unofficial one. Now, of course, the locals, who are interested in using the pass as early as possible, try to get to the other side even when the road is not yet officially opened by the authorities but it's still usable because well, the snow melted. Who decides when to open and close the road? That's the mission of The Road Infrastructure Management National Company. They actually have an English website with some useful information. How will I now when the road opens? You could always follow Martin Adventures on Facebook, Twitter or subscribe to our newsletter and will let you know. Check the real time updates on the Transfagarasan Forum. Got more questions about the Transfagarasan Highway? Let me know in the comments below. I stayed for ten days on "the island of eternal Spring" and I must say, the island did live up to its name: the weather was marvelous by any standards. 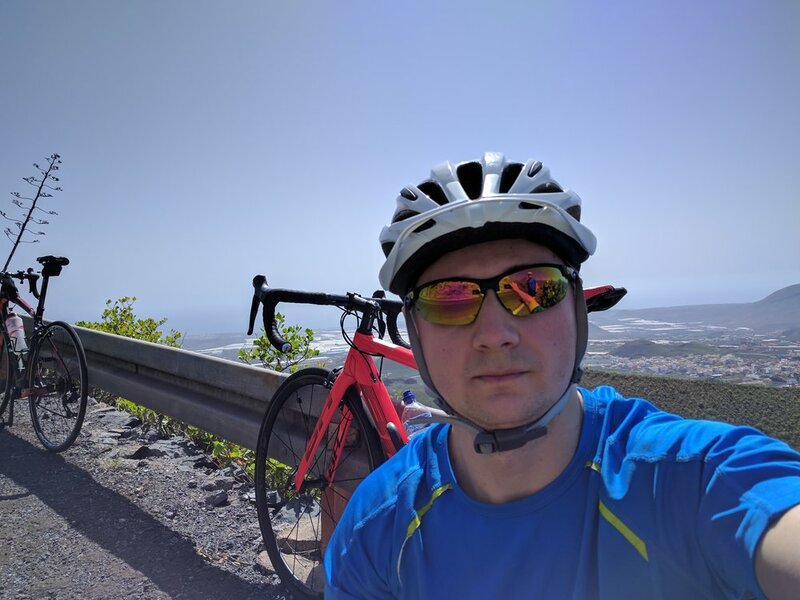 Even though the middle part of the tour was under the influence of the calima (a dry and hot wind blowing from the Sahara Desert), the weather was still good for cycling. We also explored some of the popular areas in the South, such as the Los Cristianos & Las America beaches, Los Gigantes, Masca village. 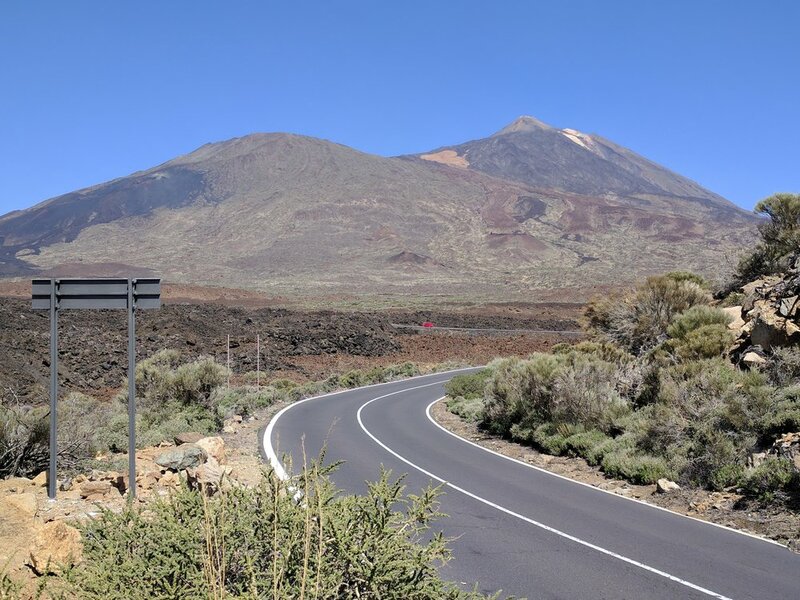 I also had the chance to visit the north of the island, around Taganana beach and then further East to Santa Cruz, which is the capital city of Tenerife. I'll leave you with some photos of the tour and a video of the descent from Mt. Teide to Vilaflor. 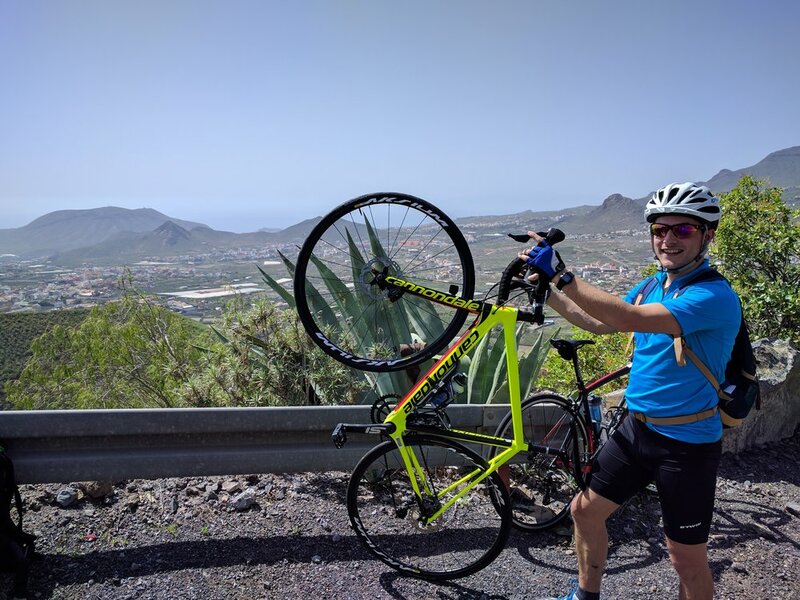 Shot during our cycling camp in Tenerife, March 2017. First of all, let me just start by stating something obvious: It's really useful to set goals in life. And I'm not just talking about cycling. I've heard from other people there's more to life than cycling. :P It's been proven scientifically that if you have goals and if you work towards them every day, you tend to achieve them. And that makes you happy. See? It's not rocket science. The best news is that setting and striving for a goal, even if you don't make it, will make you happier. Ok, since I hope I convinced you to start setting cycling goals, let me tell you how I do it. Before I get into a specific goal, I basically day dream for a while, trying to imagine some thing: a destination, a challenge, a route or a competition, that would motivate me to want to do it. I try not to limit myself in ways that are dependent of time, money, equipment or any other down to Earth reasons. For example, for this year I totally wanted to go on an incredible bike adventure on my own. I didn't know when or where but I wanted something challenging. I was feeling that in the past couple of years I haven't been so adventurous and I needed some more adventure in my life. A couple of weeks later, I found out about TCR and I instantly felt I wanted to do it. In the same instant, a dozen reasons came into my mind about why this is too crazy: no experience, no time, not enough money, equipment and other bla bla. There's no point in setting goals that are comfortable and easy to achieve, that won't give you a major adrenaline kick at the end. If you're already doing 100 k rides don't make the 2017 plan to reach 120 k. That's boring! Set a goal that it's in that sweet spot between impossible and achievable. Coming back to my goal. The TCR is certainly scaring me and keeping me awake at night but I know that with enough training I'll surely do it. Measurable - some way of knowing that you achieved your goal: a specific mileage, competition, etc. Relevant - make sure your goal is relevant to you, your passions, your overall life goals or more specific cycling long term goals. Time - have a clear deadline for achieving that goal. I would also add: have at least monthly (if it's a year long goal) checks to see if you're on track. I write them down. Yes, on paper. With a pen. I can't really stress enough the importance of writing your goals down. Almost six months ago, I started journaling again and I do it every other day. It gives me clarity, focus and it reminds me why I do the stuff I do every day. Now stick the paper on your desk or in front of your bike trainer to see it every day. Now that you have the big goal it's time to break it down in more chewable bits. For example, I'm planning to do a specific mileage each month before the TCR. This means I have to do a specific number of rides weekly to achieve that. At the beginning of each week I plan those rides to reach my quota. Now this is the really nasty part: actually having to work every day towards that goal. This is what I find the hardest and where the struggle really is. It's because it's here where the fluffy and sweet stuff that dreams are made of is meets the cold and bitter stuff reality is made of. Reality is that cold, windy, misty morning, when I have to clock this week's 200 k. Brutal! You just have to remind yourself (and I know it's sooo hard) that this is the stuff champions are made of. It's called GRIT. What are your audacious cycling goals for 2017? In the past couple weeks, I've been getting a lot of messages from you, the road cycling community, about the Transalpina and Transfagarasan cycling tour that we're doing here in Transylvania. The interest to come here and test yourselves on these two epic roads has never been so high as this year. I've decided to give you some more options for doing the road cycling tours during the high season so I've added another tour starting with the 20th of August. Check out our 2017 calendar for all the dates. Also all July tours are 100 Euro cheaper now for the next 5 people who book with us before the end of this month. That's 845 Euro instead of 945 Euro. If you're thinking of booking with us now it's the perfect time to do it. Thank you all and see you on the road! The Transfagarasan Highway in Transylvania, Romania. Copyright Martin Adventures, Road Cycling Tour. Year by year, the amazing Transfagarasan and Transalpina highways are becoming, rightfully so, more and more popular with people who are passionate about sports. In turn, this makes them perfect places to stage various types of competitions: cycling, triathlons, trail running and of, course, motor sports, just to name a few. If you're thinking of coming over to Romania on a holiday this summer and perhaps you don't have enough time to join our road cycling tour on the Transfagarasan and Transalpina, then you could give these competitions a chance. The name literally means Trans (from the Transfagarasan name) + Iron ("fier" is iron in Romanian, from Ironman). So, as the name suggest, the competition started out as an half Ironman distance race a couple of years ago. As it grew in popularity, the organizers added shorter distances for triathlon but also a road cycling race. The latter takes place on the Southern part of the Transfagarasan and the route is 45 km long. It practically represents the best part of the Southern part climb to the top. It usually takes place in the second week of September and registration costs is 15 Euro. Road Grand Tour is a series of road cycling competitions started by Alex Ciocan, a Romanian profesional cyclist. The Eroica takes place on the Transalpina and is, in my opinion, the hardest and most beautiful race in the tour. The route is 90 km long and joins the official Transalpina highway for the final 20 km, the best part of the Northern Climb. If you're around in the second part of August, I'd recommend you give it a go. According to Wikipedia, the Sibiu Cycling Tour (Cycling Tour of Sibiu until 2015) is a 2.1 category professional bicycle road race held in Sibiu, Romania. Its first edition took place in July 2011, as part of the UCI Europe Tour. Held entirely around the city, the race normally runs over four days including a prologue on the cobbled streets of the city, and two climbing stages, one on the Transfăgărăşan Road to Balea Lac and a second to the mountain resort of Paltinis. In 2017 the race will be taking place between 5th - 9th July and, most likely, the Northern side of the Transfagarasan climb will be an individual time trial. Even though you can't actually join this race as an amateur, if you're around, perhaps even joining one of our road cycling tours on the Transfagarasan, it's worth watching the big boys going for it. I'm double excited about the race. It's the first time the Transfagarasan Highway is on the official route as CP 4, the last one before the finish. More than 350 cyclist will get to see Romania and this magnificent mountain road.